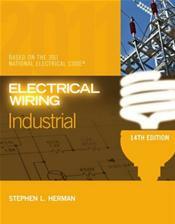 ELECTRICAL WIRING INDUSTRIAL, 14th Edition is the ideal resource for anyone in the industrial electricity industry. This book is fully updated to reference the 2011 National Electrical Code? and guides readers step-by-step through the wiring of an entire industrial building. ELECTRICAL WIRING INDUSTRIAL, 14E has a practical, straightforward approach that begins by covering the tasks and responsibilities facing today's professional industrial electricians, including: installation of electrical service; power and lighting; special new construction systems; changeovers from old systems; planning for growth and increased capacity; and periodic maintenance procedures. Specific references to the 2011 National Electrical Code? throughout show readers how to incorporate codes and principles into everyday practice and procedures. A complete set of industrial building plans is included, offering readers opportunities for hands-on practice in interpreting and applying Code requirements to sitework, feeder bus systems, panelboards, fiber optics, harmonics, hazardous locations, and more.